Good stuff. I've always maintained it takes riots to really move things along - Stonewall, May 68, '81, Poll Tax, and recent student ones that re-galvanised youthful radicalism. I'd argue extending the franchise and basic rights has always hinged on riots. It's where the marginalised and directly oppressed assert that the 'public sphere' belongs to everyone. MLK's "language of the unheard". 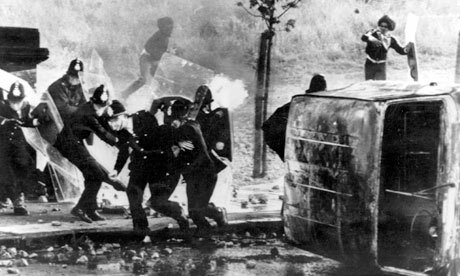 The '81 riots really did force the police to lay-off to some extent, and brought public investment for facilities, legal advocacy and urban regeneration. However flawed, it was clearly better than what was on offer beforehand. Too often, 'winning the argument' simply isn't enough. BTW if you know of any theoretical literature on riots, I'd appreciate any tips. I've always been fascinated by their function as a progressive force. Chris Harman on Brixton Riots in International Socialism journal no.14 1981 and EP Thompson's 'Moral Economy of The English Crowd in the Eighteenth Century' in the excellent 'Customs In Common' is justly well known and inspiration for a great of social and labour history that has sought to excavate the hidden social history of riot and tumult in Britain. Incidentally this year is not only the 30th anniversary of the 'Liverpool 8 Uprising' but also the centenary of the 1911 Liverpool general strike - here two workers were shot dead by soldiers (sent by Home Secretary Churchill) and days later in the national strike, two workers were shot in Llanelli - the last civilians killed on mainland Britain by the army. It's definitely a 'hidden' history in danger of being wiped away by the usual suspects. There's enough living memory to keep it alive for now, but I wonder for how long. The restructure of public space and residential areas (especially in inner-cities and city centres) definitely has 'crowd control' in mind. A case of space affecting time.